Gondar, the Capital of Abyssinia, with part of the Lake Tzana. 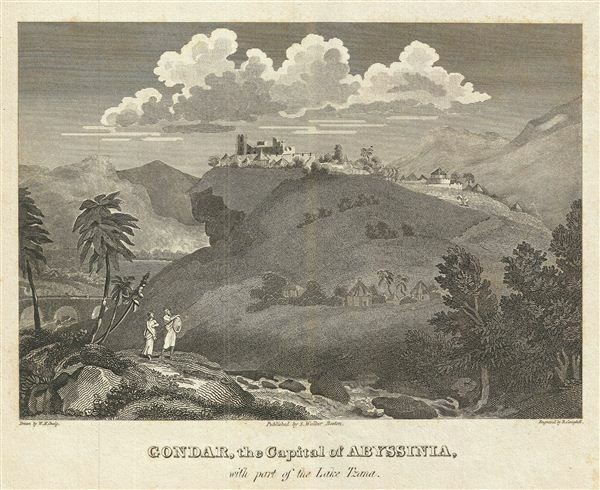 This is an uncommon example of the 1828 view of Gondor, the ancient capital of Abyssinia (modern day ethiopia), drawn by W. M. Craig. It features a lovely view of the city with part of Lake Tzana (Lake Tana). The Fasilides Palace can be seen in the background. Lake Tana, the source of the Blue Nile, is the largest lake in ethiopia. This view was engraved by R. Campbell as part of Malte-Brun's System of Geography, Vol. I., published in New York by Samuel Walker. Very good. Blank on verso. Minor overall toning.